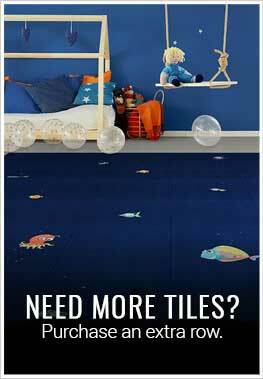 Description - Take a journey under the sea with Aquarium Flex Tiles. This fun and unique flooring option is perfect for any space with kids where an imaginative floor covering may be necessary. Constructed using 100% virgin vinyl, you can rest assured that this kit is safe for the whole family and other alike. Aquarium Flex Tiles are durable, easy to clean, and are mold and mildew resistant. Since they install without glue, you can easily move this kit and take it with you if you so choose. Recommended Uses – Aquarium Flex Tiles are recommended for use in spaces with children, such as classrooms, day cares, nurseries, waiting rooms, dental offices, as well as bedrooms, playrooms, and more. The kids love their new play mat! They play like they are under the sea with the fish.